Scientific Name: Rosmarinus officinalis L.
Crickets chirping, the full power of the sun in your face, clear, pungent air. Scents tell stories. 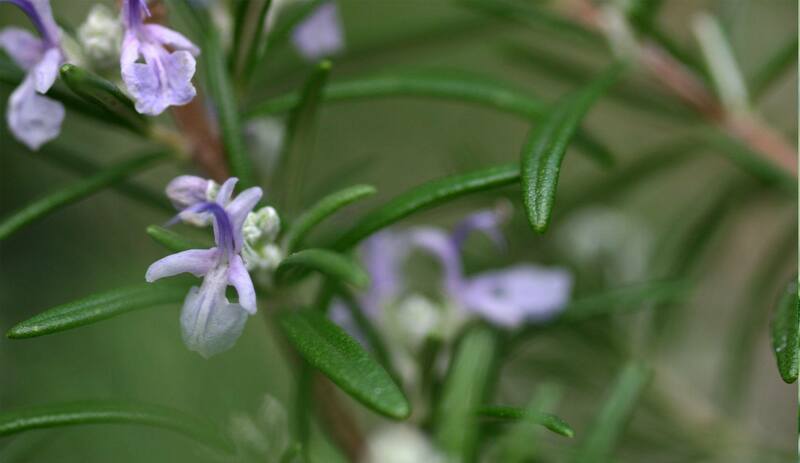 Rosemary brings with it pictures of its native Mediterranean home where this shrub covered in bluish-green, needle-like leaves can grow to a height of six feet. From March to May it is adorned with pale blue two-lipped flowers which are arranged at the tops of the branches. This evergreen shrub is a particular lover of dry, hot slopes. The original form is only moderately tolerant of frost. In our part of the world it can therefore only be grown outside throughout the year in sheltered places. Incidentally, there are now winter hardy varieties which can withstand temperatures as low as -15°C. Rosemary tonifies the circulation and harmonises the nervous system. It is used for abdominal colics, rheumatism, gout, chronic debility and low blood pressure. Taken internally it also helps relieve fullness, flatulence and mild crampy gastrointestinal and biliary disorders. Used sparingly as culinary herb it makes all dishes easier to digest. There is disagreement about the origin of the word Rosemary. Some people say it comes from the Greek rhops myrínos = pleasant smelling shrub. Others say it is derived from the Latin words ros = dew and mare = sea, indicating its habit of growing in coastal areas. In ancient times Rosemary was dedicated to the goddess Aphrodite and was used for adornment of both gods and humans. In the first century AD colonising monks carried Rosemary across the alps to northern Europe. In the 16th century Rosemary achieved renown as Hungary water, a distillate of fresh Rosemary flowers and alcohol concocted specially for Queen Isabella of Hungary who was paralysed and suffering from gout. It is said to have cured and rejuvenated her so completely that a Polish king asked to marry the 72-year-old. In ancient customs Rosemary is found as symbol of love and as wedding decoration. It was said that anyone who touched a flowering Rosemary bush would soon be inflamed by love and marry. Men who are left cold by the scent of Rosemary are said to be incapable of true love. But Rosemary is also described as a plant associated with death. We must leave it to the reader to fathom how the plant comes to have these two contrary associations. If we want to know what a plant smells like we spontaneously bend down to smell the flower. This is usually where we can inhale the essential oils. Not so with Rosemary. The fragrance comes not from the flowers but from the leaves, which are so full of essential oils that the air is laden with them far and wide. Leaves that are like flowers? On the one hand they exude fragrance on the other hand they are contracted to narrow needles which scarcely deserve to be called leaves. The sun has left its formative traces here, the strong sun of the Mediterranean summer, the sun which Rosemary loves so much and which it collects within itself in order to bestow it on us. Thus Rosemary is warming and at the same time forming, structuring and stimulating. Dr.Hauschka skin care products containing Rosemary are, Rosemary Foot Balm, Revitalising Leg and Arm Tonic, Neem Hair Oil and Revitalising Hair and Scalp Tonic.